The Tasmanian Museum and Art Gallery (TMAG) and the University of Tasmania today reaffirmed their partnership and flagged an increased emphasis on collections based research. A new Partnership Agreement articulates the shared commitment of both organisations to work collaboratively to grow creative, scientific and cultural capital within Tasmania and strengthen the state’s creative and cultural industries sector. TMAG is a premier cultural attraction that supports the Tasmanian Government’s goal of growing the sector by contributing to the visitor economy and building Tasmania’s brand. Under an historic partnership signed last year, the University and Government are also committed to working together to improve educational, social and economic opportunities for all Tasmanians. University Vice-Chancellor Professor Peter Rathjen said he looked forward to strengthening collaboration around collections-based research to help grow Tasmania’s cultural capital and drive broader public engagement and access. “As we work towards our shared goals within the cultural sector, this Agreement provides our two organisations with a framework for us to operate within and creates an impetus to look for opportunities to work together,” Professor Rathjen said. TMAG Director Janet Carding said the agreement built on the success of recent partnerships with the University and would lead to exciting new and innovative projects together. “We are both looking at ways to address the changing needs of visitors and the changing world of museums and the way collections are presented,” Ms Carding said. The University and TMAG have a long history of collaborating on a wide variety of projects spanning the arts, humanities and science. Recently the successful partnership between the University’s Wicking Dementia Research and Education Centre and TMAG staff resulted in the creation of two iRemember loan resources, designed to assist people living with dementia. In 2016, TMAG partnered with university staff to help deliver two popular exhibitions, the poignant migrant history exhibition, Snapshot Photography and Migrant Women: A Tasmanian Experience, and innovative major art exhibition Tempest. The partnership agreement was signed by Professor Rathjen and TMAG Chairman of Trustees Geoff Willis, in the John Elliott Classics Museum on the University’s Sandy Bay campus. 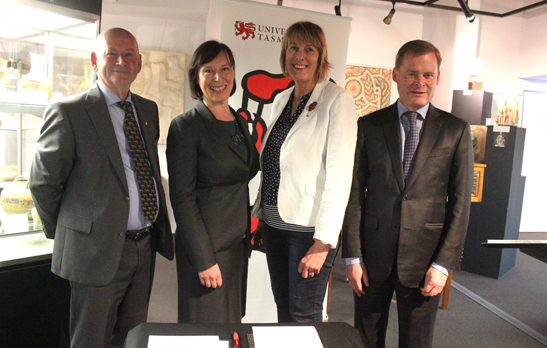 Image details: (L-R) TMAG Chairman of Trustees Geoff Willis, TMAG Director Janet Carding, University of Tasmania Professor Janelle Allison and University Vice-Chancellor Professor Peter Rathjen at the partnership agreement signing.